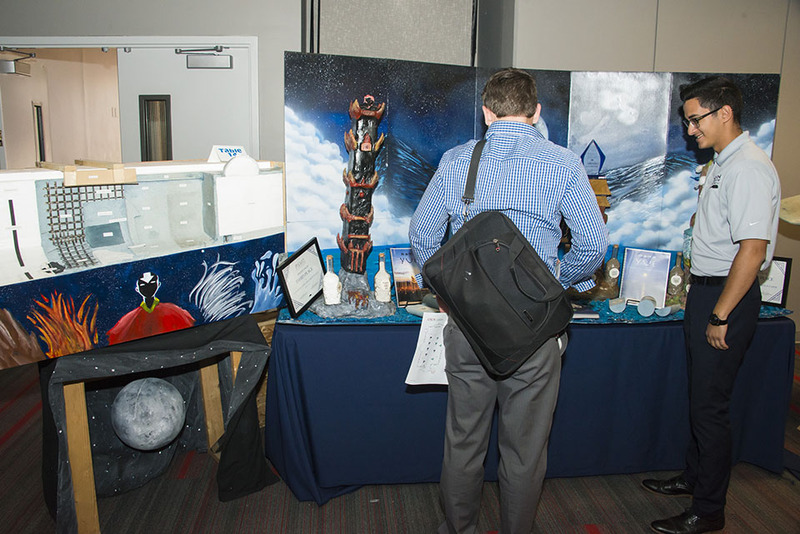 The ninth annual Senior Design Project Showcase featured 29 design projects from all the undergraduate programs within the college, such as a canoe, a laser-powered printer, a scooter that transforms into a crutch and more. Photo by DJ Hawkins. California State University, Northridge has long been a hub of innovation. 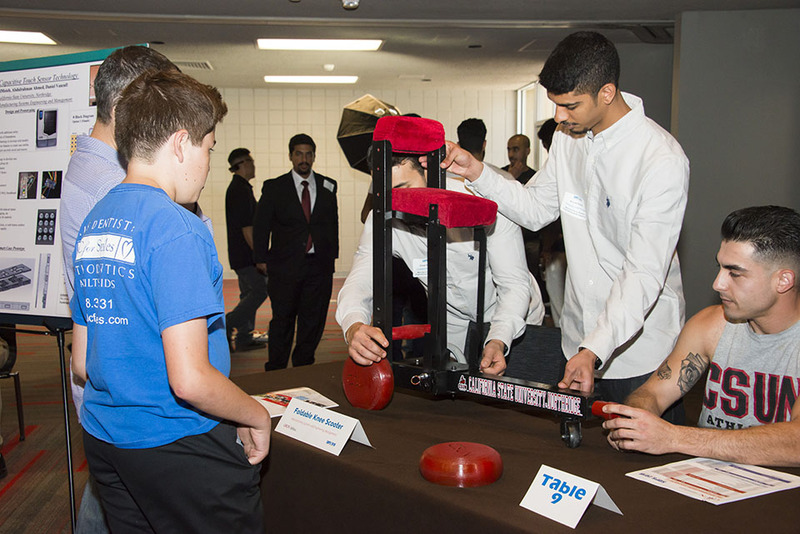 This spring, talented engineering students wowed attendees at a project showcase featuring a concrete canoe, a laser-powered printer, a scooter that transforms into a crutch and more. 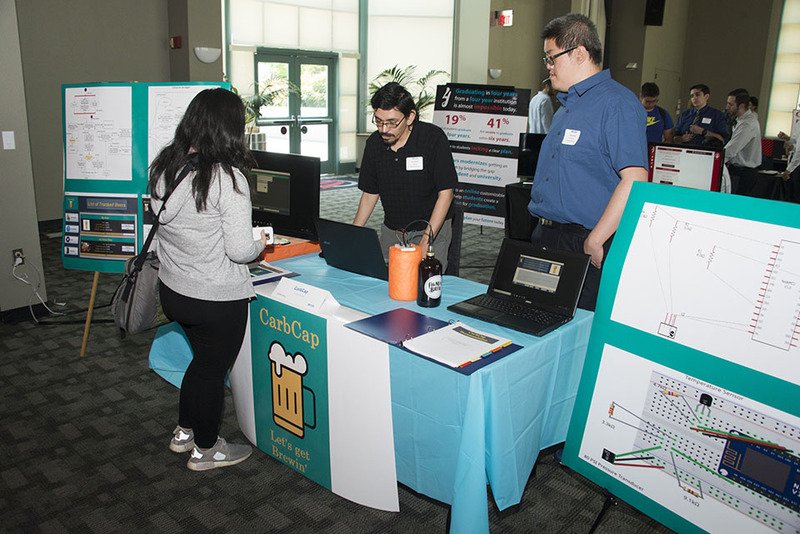 On April 27, the College of Engineering and Computer Science hosted its ninth annual Senior Design Project Showcase. 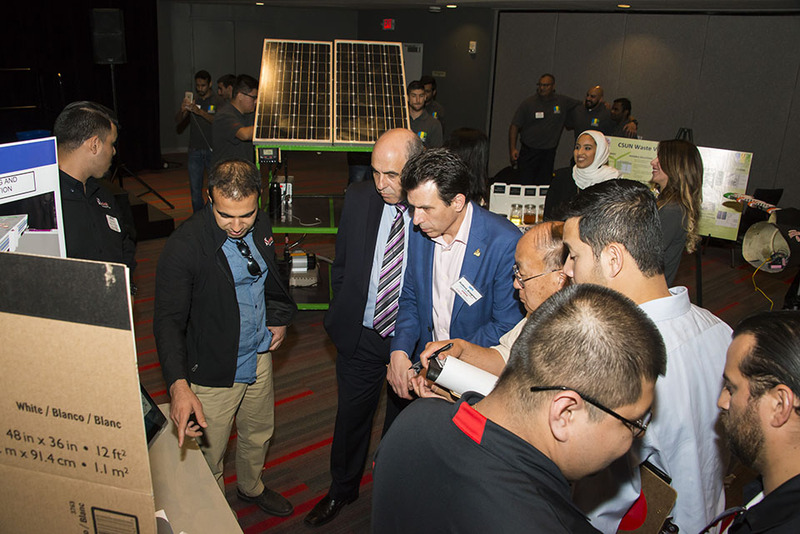 This year’s event featured 29 senior design projects from all the undergraduate programs within the college. As in past years, the projects were judged by a distinguished panel of industry experts. Participants competed for cash prizes in oral presentation and project display categories, as well as an overall grand prize of $1,000. “This is a wonderful event for our college,” said Hamid Johari, interim dean of the College of Engineering and Computer Science. 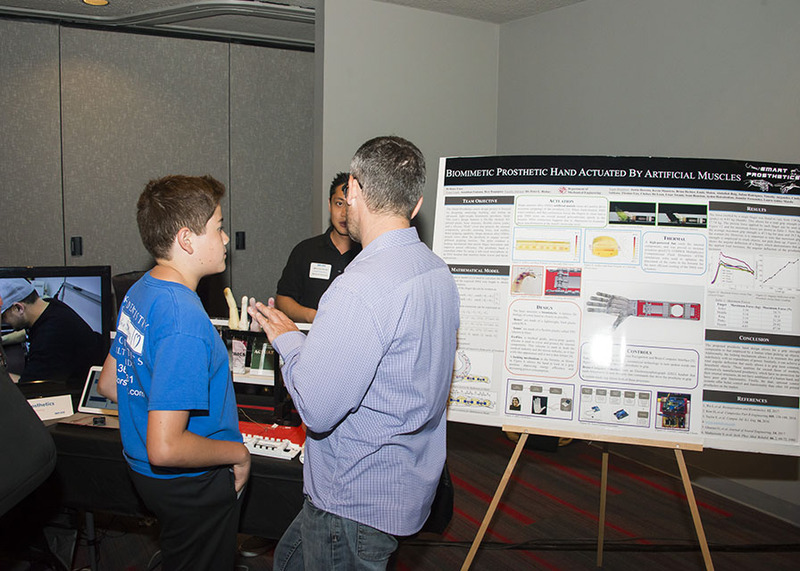 “Engineering is an area where students can show off their projects. Students have been working very hard for about a year now, and [in this event], they showed the outcome of their senior projects. This is the fruit of their studies. Choosing the showcase winners was difficult for Anagnost and the 26 other judges. Ultimately, it came down to specific criteria. “The first thing I look for is, can they articulate what problem they’re solving? Because a team that can articulate what problem they’re solving really knows what they’re trying to accomplish,” Anagnost said. “The second thing I look at is, have they looked at the project across the board? Are they building something that’s actually practical in terms of cost and manufacturability, and have they taken into account all the things that can actually make their product successful or fail? 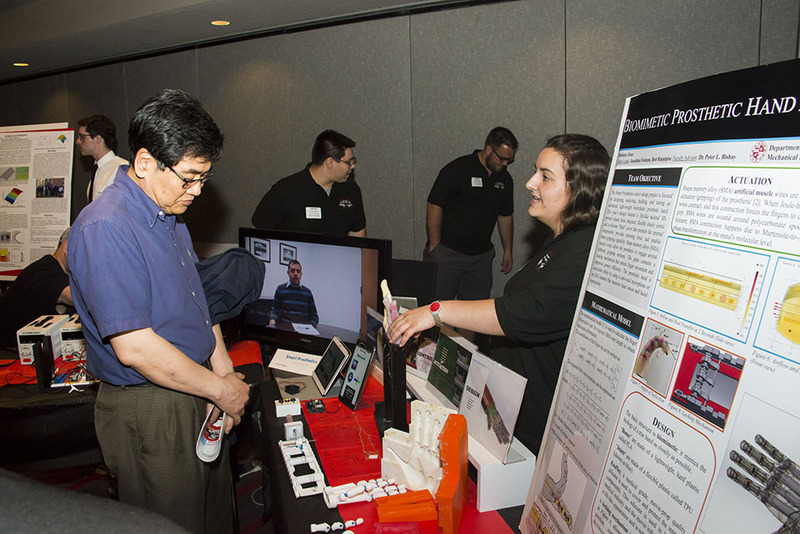 The winning project in the oral presentation category was Ultra-Violet Digital Light Bioprinter, from CSUN’s Department of Manufacturing Systems Engineering and Management. 3-D bioprinting has opened the doors to new methods of printing, especially the methods used for tissue engineering and the production of artificial organs and tissues. For the CSUN students’ bioprinter project, the printer was used to create a precise placement of cell-laden hydrogels in a layer-by-layer fashion. Some projects that were recognized in the project display category were Concrete Canoe, from the Department of Civil Engineering, and Foldable Knee Scooter, from the Department of Manufacturing Systems Engineering and Management. The Concrete Canoe team was able to analyze and develop an efficient canoe design that withstands hydrodynamic forces, is stable and can propel across coastal waters. 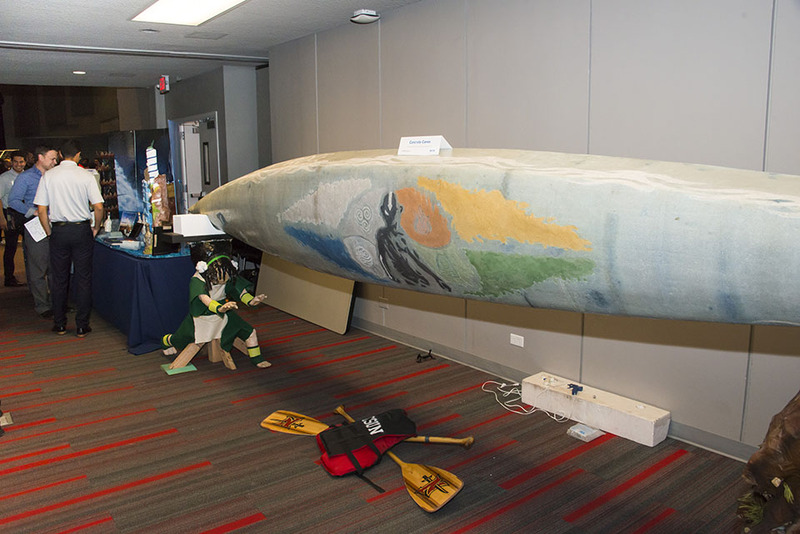 At the event, they displayed their canoe, decked out with images from team members’ favorite show, Avatar: The Last Airbender. The aim of the Foldable Knee Scooter project was to design and manufacture a unique solution for people with lower-leg injuries. The team of students created a transformable knee scooter that can be folded into a crutch, allowing patients to move in a more stable way by helping them climb stairs or stand steadily. “We did rigorous design processes, where we did extensive research and analysis,” said team captain Faisal Binblaihed. “After that, we did 3-D modeling with multiple durations, to find the perfect one and the easiest to manufacture. Then, we used the skills that we learned in the machine workshops to make this with metal scraps that we found in the shop. 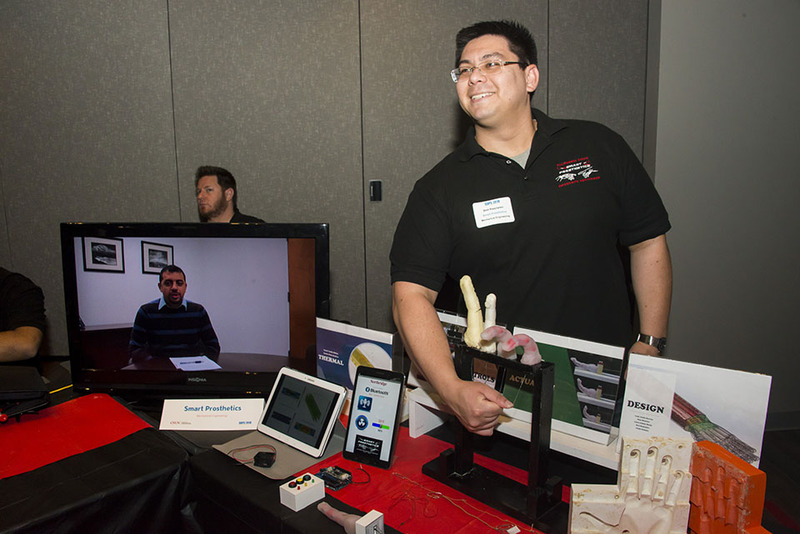 The day’s grand prize winner was Smart Prosthetics, which was also recognized with oral presentation and project display category awards. Smart Prosthetics focused on designing, analyzing, building and testing advanced, lightweight biomimetic prosthetic devices. The team’s prosthetic hand design features life-like skeletal 3-D-printed plastic bone structure, flexible elastic joints and a silicone “flesh” cover that protects the internal components, provides restoring force and enables better gripping capability. “We wanted to build a biomimetic prosthetic, which means something that mimics biology as closely as possible in the human body,” said Jonathan Fontana, a member of the Smart Prosthetics team.